If you dropped £20 into your kitchen bin, would you reach in and fish it out? Yeah, of course! Me too. But it turns out that every week across the UK, the average family throws away about £15 worth of food. Yes some of that food will have gone off, but the crazy thing is that the majority of that £15 is still perfectly good to eat. That’s over £700 a year we are throwing away. Imagine how happy you’d feel if you actually found £700 in a bin sack! But why are we throwing away so much perfectly decent food, bought using our hard earned cash? Well, research says, it has a lot to do with Best Before dates. It’s a big area of confusion for many of us and, because none of us wants to poison our families, we err on the side of caution and end up throwing away food that is perfectly good to eat. So here’s a quick guide to saving over £700 a year. Use By dates are used on perishable foods like meat, fish, soft cheese and most dairy products that go off quickly. You really shouldn’t eat these foods after the stated Use By date, even if they look and smell fine. Some harmful bacteria such as Salmonella and E.Coli for example, cannot be detected by smell or taste. Best Before dates however, are very different. They are used on products with a much longer shelf life such as biscuits, jams, crisps, tinned foods…essentially everything else. 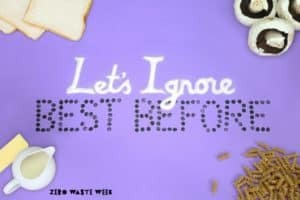 After the ‘Best Before’ date, it is possible the food may not taste quite as good, or the texture may have altered slightly, but it will STILL BE SAFE TO EAT so you don’t need to throw it out. The truth is, for the vast majority of food, you probably won’t even be able to tell the difference between food eaten before or after the ‘Best Before’ date. The only exception to this Use By / Best Before system is eggs (apparently it has something to do with EU regulations). Eggs have a Best Before date, but do indeed go off. But don’t worry…here’s a simple little test you can do to avoid throwing away good eggs (or eating bad ones!). Place the eggs in a bowl of cold water. If they sink to the bottom and lay flat on their sides, they are fresh. If they sink to the bottom but stand on one end, they are a few weeks old but still good to eat. If they float to the surface, they’ve gone off and you shouldn’t eat them. Now that you’ve got your heads around that, one more thing. On products that have a ‘Best Before’ date, you may also find a ‘Use Within’ date. This means that once opened, the product will start to go off and should be used within the time specified. Not to be confused with ‘Best Within’ which means that the product can still safely be eaten after the period stated, but may not be at its’ best. Clear? So, to recap, Use By dates are about food safety and you should pay attention to these. Best Before dates are only about quality and you can be the judge of that! It’s a big difference and understanding what Best Before actually means can go a long way to helping us all reduce our food waste and start saving considerable amounts of money! If the ‘Use-By’ date is looming and you’re not going to get the chance to eat it, you can cook the food if applicable and store it in the fridge for 2 days, or freeze it. Food can be frozen right up until the ‘use-by’ date. (Look out for my blog later in the week about common myths surrounding freezers and why we don’t need to chuck food away from those either). 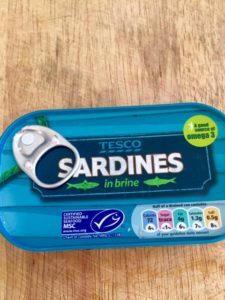 And finally, just to show that food is #stillgood after the Best Before date, recently I ate a tin of sardines that was 18 months past its Best Before date. I’m ashamed to say that I’ve no idea why I bought them, but I can tell you they were absolutely fine and so am I.
I think we could all do with some encouragement around Best Before dates as we are a naturally cautious lot, so if you’ve eaten something after the Best Before date, as part of ZeroWasteWeek, please share it on twitter using the hashtags #stillgood and #ZeroWasteWeek. Why not go and explore the back of your cupboards now and see what perfectly edible and tasty food you’ve got lurking there. My husband & I will eat out of date yoghurt, ( much to the disgust of our children!). Generally speaking they taste & look absolutely fine. Always do the smell test! Well I’d never come across ‘use within’ before – what an informative post. And I love the idea of fishing £20 out of the bin if you dropped it in; that really helps put things in perspective. Thanks for clearing up this issue and I hope it encourages readers to be more courageous with ignoring best before dates!